WPI has been innovating in the field of materials process engineering since our founders made their fortunes in tinsmithing and wire drawing. WPI’s Materials Process Engineering program focuses on improving the materials we have, discovering new ones, and finding original ways to use existing materials to produce high-quality, cost-effective parts and systems. With a foundation of theory and hands-on research, students understand the science of materials, materials processing, and business practices. Within focus areas of Manufacturing Engineering, Materials Science & Engineering, and Management/Industrial Engineering, students study manufacturing processes like nanomaterials and biopolymers and topics like lean manufacturing, casting and heat treating, cost analysis fuel cells, and surface metrology. Materials process engineering students also study the innovative use of traditional materials and processes like aluminum casting, heat-treated steel, and powder processing of ceramics. Learn how WPI researchers are melting recycled aluminum and processing it—without the costly step of re-machining—for reuse in manufacturing. 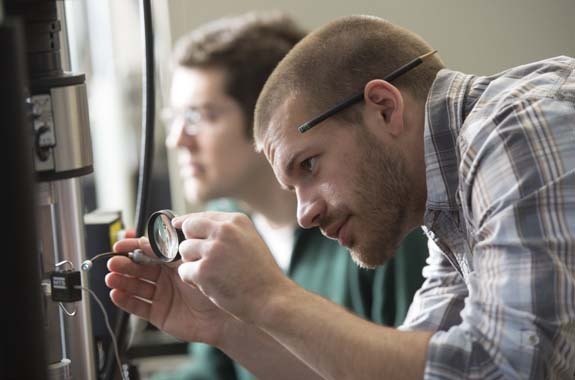 Graduates with a materials process engineering degree have the marketable skills in both materials science and manufacturing practices that employers seek. Our grads become managers or move into scientific or engineering roles to apply their knowledge in everything from aluminum casting to surface treatments. Materials process engineering students who want to earn a combined BS/MS degree in an accelerated time are encouraged to apply to the program during their junior year. Interested students will need to fill out the online graduate admissions application noting both the BS/MS option and materials process engineering. Graduate-level students in the Materials Process Engineering program may participate in industrial internships offered in partnership with the Metal Processing Institute. The internships offer essential hands-on experience to the student and benefits to industry, as well.